Ok.. everybody has a March Madness bracket but nobody has a bracket like ours! 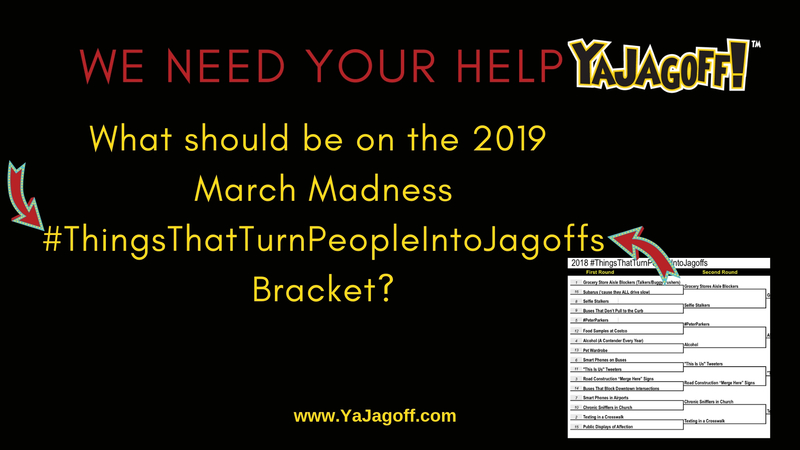 For the 4th year, we are asking you to vote on what things turn people into jagoffs? Is it a shopping buggy, a Prius, a Subaru a cell phone? Last year’s bracket winner, as you can see below, was alcohol. So now it’s time to offer entries. What should be on the bracket? Email us or comment below… if you’re entry is selected for the bracket and wins the tournament, you will win a prize! The bracket will be revealed on Monday, March 25th. Next articleNew Video – Jaggin’ Around at Kennywood with Steeler Chris Hoke!